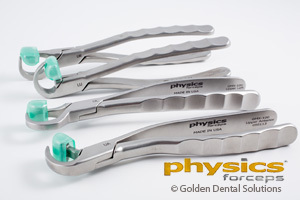 The unique design of the Physics Forceps allows for light but constant pressure to be applied to the tooth which leads to chemical changes in the PDL and subsequent release of the Sharpey's fibers. Once the tooth releases, it can be removed simply with a rongeur or even just your fingers. The Physics Forceps are an innovative design that provides a simple mechanical advantage by employing first-class lever mechanics. Utilizing the patented "beak and bumper" technique, you can simply and predictably extract virtually any tooth in any condition, while preserving the buccal bone and socket. The beak of the Physics Forceps is designed to apply controlled pressure parallel to the long axis of the root. The bumper acts as a simple fulcrum or pivot point. While traditional instruments grasp, squeeze and twist, the Physics Forceps employs a slow, steady force that releases the tooth from the alveolar bone. By combining the biomechanical advantages of a first-class lever with the biochemical reaction that is occurring, extracting teeth has never been easier than with the Physics Forceps. When the periodontal ligament is traumatized with forceps or elevators, hyaluronidase is released. Once this chemical breakdown of the periodontal ligament by hyaluronic acid is sufficient, the tooth is released from its attachment to the alveolus and can be removed. This explains why the Physics Forceps with its steady unrelenting trauma to the periodontal ligament quantitatively creates a greater release of hyaluronidase in a shorter period of time than traditional forceps or elevator extractions because the trauma from those techniques is intermittent. This is what makes the Physics Forceps more efficient, faster, and less traumatic to the alveolar bone. 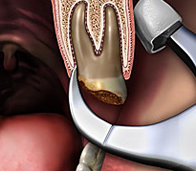 By utilizing the Physics Forceps Technique (no squeezing, applying constant steady pressure with the wrist only and using the bumper as a pivot/fulcrum), it is uncommon to break the buccal bone or cortical plate. Think of the Physics Forceps as an elevator – all you want the instrument to do is move the tooth 1-3mm through constant steady pressure allowing the PDL to separate from the tooth. Once this chemical breakdown of the periodontal ligament by hyaluronic acid is sufficient, the tooth elevates coronally. You are now finished with the Physics Forceps. You can deliver the loose tooth with a traditional instrument. Also, the bumper is a compressive force that is holding the bone in place. Even though you are not squeezing, it is supporting the bone. Separate the gingival attachment from the tooth. All upper teeth, including molars can be extracted without any sectioning. Lowers molars occasionally need to be sectioned (lingual buccal) to ensure a more predictable extraction, by significantly reducing resistance to extracting forces. With the handles wide open, set the beak into the depth of the lingual or palatal sulcus on solid root surface. A secure purchase point on solid root surface is critical to successfully rolling out the tooth. When necessary, create a small trench with a small flame shaped diamond burr to engage the beak more securely on solid root surface. Set the bumper perpendicular to the tooth at about the level of the mucogingival junction. Holding that position securely, freeze don't squeeze the handles. Note: the greater the distance between the beak and the bumper, the greater the arc of rotation, consequently achieving vertical lift. Separate the gingival attachment from the tooth. All upper teeth, including molars can be extracted without any sectioning. Lowers molars occasionally need to be sectioned (lingual buccal) to insure a more predictable extraction, by significantly reducing resistance to extracting forces. Without squeezing the handles or moving your arm, begin to apply a steady, very slow rotational force in the direction of the bumper patiently, continue to apply this steady force for 30 to 40 seconds. This force or creep will continue to build, allowing time for the periodontal ligament to release, the bone to slowly expand & the tooth to disengage. Initially, you may want to avoid unnecessary damage to the buccal plate by not proceeding with the Physics Forceps beyond the first sign of the tooth 'popping' loose. If the tooth has not elevated sufficiently to grasp it with your fingers, consider using a hemostat, rongeurs or conventional forceps to lift it out.